So Indianapolis Colts’ owner Jim Irsay is “frustrated” he only won one Super Bowl during the 14-year Peyton Manning era? I think he has every right to be, and I also think Manning will never be considered among the top five greatest NFL quarterbacks until he wins at least one more ring – and even then he may be on the outside looking in. 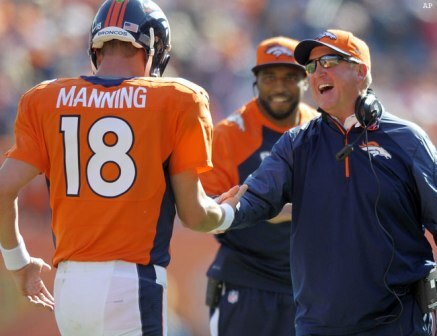 Denver Broncos’ coach John Fox had Peyton Manning’s back this week (Denver Broncos’ photo). Bart Starr. The Green Bay Packers legend was 9-1 in the playoffs (best winning percentage ever) and won an astounding seven championships, including the first two Super Bowls in 1967 and ’68. He was also the MVP in those two games. Doesn’t get much better than that in terms of postseason production. Joe Montana. The guy was 16-7 in the playoffs (just one off the all-time victory mark) and collected four Super Bowl rings with the great San Francisco 49ers teams of the ’80s. Terry Bradshaw. The Pittsburgh Steelers signal caller from the ’70s was 14-5 in the playoffs and he and Montana are the only members of the four-ring club. Tom Brady, Kills me to admit it because I hate the New England Patriots, but he has the record for the most playoff wins (17-7) and is 3-2 in Super Bowls. He’d be the only five-time winner if not for the heroics of Peyton’s little brother Eli in Brady’s two SB losses. Troy Aikman. Again, a team I love to hate, but the Dallas Cowboys star of the 1990s is the only other guy in the three-ring club with Brady, and he was 11-4 in the playoffs. Packers Hall-of-Famer Brett Favre is actually higher than Aikman on the playoff wins list with 13 (against 11 losses), but he only won that one ring, famously losing his second shot to John Elway and the Denver Broncos in 1998. I’d love to put Elway on my top five list because I’m a diehard Broncos fan, and he did go 14-7 in the playoffs, tying Bradshaw for the third-most post-season victories. But Elway was 2-3 in Super Bowls because of the mind-numbingly conservative play calling of coach Dan Reeves in the 1980s and the seriously subpar defenses and even supporting offensive casts around Elway. When he had the weapons in ’98 and ’99, Elway went back-to-back. Would Broncos’ owner Pat Bowlen have been “frustrated” with just one ring if Elway had been too injured to play after beating Favre and the Packers in 1998? Probably. But the utter humiliation of being crushed by the Redskins, Giants and 49ers in three previous Super Bowls would have eased that frustration. Still, a badly hobbled Elway didn’t sit out in ’99. He came back and annihilated Reeves and his “Dirty Bird” Atlanta Falcons in Super Bowl XXXIII. What if Elway had been too injured to play that season and the Broncos fell to 2-14 and had a chance to draft their next franchise QB? OK, bad example. There was no Andrew Luck or Elway in the ’99 draft. The best QB was Donovan McNabb – taken second overall by the Philadelphia Eagles – and he’s tied with Peyton at nine playoff wins, but McNabb never won it all. Which brings us back to Peyton and his ungrateful former owner Irsay. There are six guys tied with nine playoff wins each: Peyton Manning, Joe Flacco, Kurt Warner, McNabb, Jim Kelly and Starr. Of that group, Starr is in a class by himself, and Warner, Manning and Flacco are all tied with “just” one Super Bowl ring. Kelly and McNabb would have loved “just” one. There are a few two-ring guys I would actually rank ahead of Peyton, Flacco and Warner. Peyton’s little brother Eli (eight playoff wins); Roger Staubach (11-6 in the playoffs with the Cowboys); Ben Roethlisberger (10-4 for Pittsburgh) and Jim Plunkett (eight playoff wins). A couple of other eight-playoff-win guys include Steve Young, who filled Montana’s cleats with a Super Bowl win in 1995, and Miami’s Dan Marino, who put up all-time “Star Wars numbers” but never won it all. Ask Marino if he would have been happy with “just” one ring. First of all, for Irsay to even bring up Baltimore is an insult. His father Robert snuck the Colts out of that city in the 1980s and moved the team to Indianapolis. And the Ravens mostly won their rings with defenses led by Ray Lewis. Flacco got the last one, and Trent Dilfer, who will never land on anyone’s all-time greatest list, won the first one in 2001 throwing for 153 yards and one TD. And speaking of “Star Wars numbers,” it’s laughable to say Brady never put them up. How about his record for 50 touchdown passes in his undefeated season (until Eli bounced him in the Super Bowl back in 2008)? Denver coach John Fox was right to call him “ungrateful,” but Irsay makes a good point about one-and-done playoff exits. Peyton Manning has a losing record in the playoffs at 9-11, so he needs to make a deep run and win another title in the next couple of seasons before he retires in order to forever shake his “Greatest Regular Season Quarterback” title. Just like Elway needed those two rings to get him out of the ring-less class of QB greats that includes Kelly, Marino and Fran Tarkenton. Denver sports fans agree with Irsay that just making the playoffs is not enough. Look what happened to one of the greatest regular-season NBA coaches of all-time, George Karl. After a decade of first-round exits and despite a Coach of the Year award, Karl was shown the exit after last season. And Carmelo Anthony, arguably the greatest basketball player in Nuggets’ history, will never go down as one of the all-time NBA greats unless he wins “just” one ring …. and it might take two. Sorry, that’s just the way success is measured in sports.